What's it about? 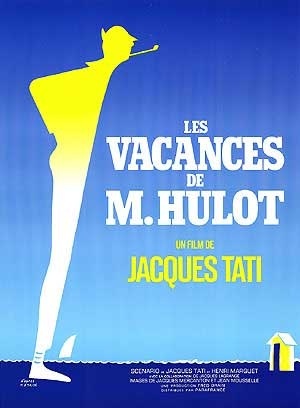 The ever-so-polite, but hopelessly clumsy and bumbling M. Hulot (Jacques Tati) goes on holiday to the seaside. There, he causes havoc amongst the other holiday-makers with his antics. Is it any good? Remember those trips to the beach you took when you were a kid? Those days when the whole family set out determined to have a good day out at the beach? They were all enjoyable enough, but when they were over, there was a nagging feeling they didn't quite live up to their promise? Well, that's what this film is like. There is no plot to speak off as such, just some good gags and some nicely choreographed slapstick, which Tati diplomatically shares out amongst all the cast. Highlights include a rubber tyre that gets mistaken for a wreath, a paint pot taken in-and-out by the tide at just the right moments for Hulot to dip in his paintbrush and the climactic firework display. But few of them actually give you a proper belly-laugh. Even Tati seems unconvinced about their comedy value, often cutting away from set-ups and scenarios before they seem to have fully played out. It's all performed with very little dialogue, which gives it the old-fashioned charm of a mime act, but it feels like a curious combination of carefully planned routines stuck together in a rather slapdash way. I don't trust you. What do others think? Despite a slim body of work, consisting of only 6 directorial features, Tati often gets compared to Charlie Chaplin and Buster Keaton as a similarly inventive comedian and influential film-maker. That rather flatters him, but he was genuinely popular and the public liked M. Hulot enough for him to return in three other films Mon Oncle, Trafic and Play Time. And those of you thinking the behaviour of M. Hulot sounds a lot like Mr Bean, award yourselves 10 points, as Rowan Atkinson has acknowledged Tati as a big influence on that character. Anything else I should know? There's a nice little anecdote about when French president Charles de Gaulle met Tati. "Jacques Tati" whispered de Gaulle's aide in his ear as the men were presented. No reaction from de Gaulle. "Mon Oncle" prompted the aide, helpfully, whereupon de Gaulle warmly congratulated the bemused Tati on the fine nephew he had. That story kind of sums up M. Hulot's Holiday - it'll make you smile but you won't necessarily be telling your mates about it down the pub.